Our Products >> Bellana Visits Paris! In her second travel adventure, Bellana and her touring companions-Molly the Cat, Porckchop the Bulldog, and Hopper the Bunny-visit the City of Lights, Paris, France. Through their exciting visit, young readers will learn about some of Paris's most well-known and recognizable attractions and sites. 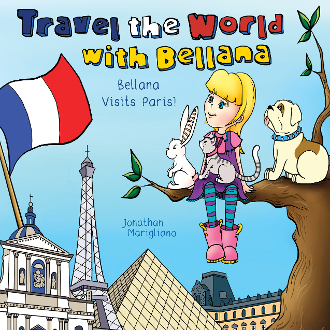 Beautifully and colorfully illustrated, the Travel the World with Bellana series makes learning about different cities fun and exciting for your child. See if you can find a hidden croissant in each picture! Come along with Bellana and her friends as they visit Paris.